Discussion in 'Scientology Infiltrates Society' started by CommunicatorIC, Jun 30, 2014. Pam Bondi has endorsed Donald Trump. WASHINGTON -- Donald Trump paid the IRS a $2,500 penalty this year, an official at Trump's company said, after it was revealed that Trump's charitable foundation had violated tax laws by giving a political contribution to a campaign group connected to Florida Attorney General Pam Bondi. The improper donation, a $25,000 gift from the Donald J. Trump Foundation, was made in 2013. At the time, Bondi was considering whether to investigate fraud allegations against Trump University. She decided not to pursue the case. Earlier this year, a liberal watchdog group raised new questions about the three-year-old gift. Citizens for Responsibility and Ethics in Washington, filed a complaint with the IRS — noting that, as a registered nonprofit, the Trump Foundation was not allowed to make political donations. How come Scientology's front groups donate money to various politician's and they get away with it? I was regged for donations....did not know "religions" could not contribute to the Political Extortion Ring called United States Govt. Technically, the Church of Scientology did not contribute. Individual Scientologists coincidentally chose to contribute. And all we know that the Church of Scientology had absolutely nothing to do with that. Florida AG Pam Bondi hosting human rights event at Scientology’s HQ. Florida Attorney General Pam Bondi is scheduled to speak at the Fort Harrison Hotel on October 1, to address Scientologists on her efforts curb illegal drug use and human trafficking. Scientologist Steve Sigal announced the event on social media, and said it would be “very theta,” which is a Scientology phrase for having positive life energy. Sigal is a founder of the Clearwater-based marketing company SJS Associates, and was involved in a controversial campaign fundraiser for Bondi at the Fort Harrison in July, 2014. The October 1 event is being sponsored by Florida Citizens for Social Reform, an IRS-registered non-profit, non-tax exempt social welfare organization co-founded by Steve Sigal’s wife Joanie. Past events by FCSR have promoted the Scientology front groups Foundation for a Drug-Free World and a Narconon-like program to help Gulf War veterans detoxify their bodies. Florida AG Pam Bondi to speak at event hosted by group with ties to Scientology. Attorney General Pam Bondi is preparing to speak next month to a group that has ties to the Church of Scientology. Bondi will discuss human trafficking and anti-drug initiatives at an event sponsored by Florida Citizens for Social Reform, a social welfare group and onetime political committee associated with the Church of Scientology. Bondi’s Oct. 1 appearance will be held at the Fort Harrison Hotel, the flagship of Scientology’s Clearwater spiritual headquarters. “Considering the seriousness of this issue, the Attorney General is open to talking to any organization about what our office is doing to combat this awful crime and educate them on what they can do to help,” said Bondi spokeswoman Kylie Mason. Pam Bondi thrills at Scientology’s mecca. Let’s start at the Church of Scientology’s spiritual headquarters, where Florida Attorney General Pam Bondi made an appearance Sunday at Scientology’s most holy site, the Fort Harrison Hotel, and gave a talk about her fight against illegal drugs and human trafficking. Hilarious....Bondi talks at Flag...about Human Trafficking.....that's a doozy. All the other guy has to do is publicize the fact that the "AG is backed by a cult" & "AG is accepting money from a cult that may be subject to prosecution by the AG". "What do the Scientologist want from this candidate?" Ok.... that would kick up a hornets nest.... or a sciobot nest... do sciobots nest? The AG prosecuting the AG? Is here some law in Florida that encourages Schizophrenia? There is a report that Pam Bondi is being considered as a permanent replacement for ousted Attorney General Jeff Sessions. 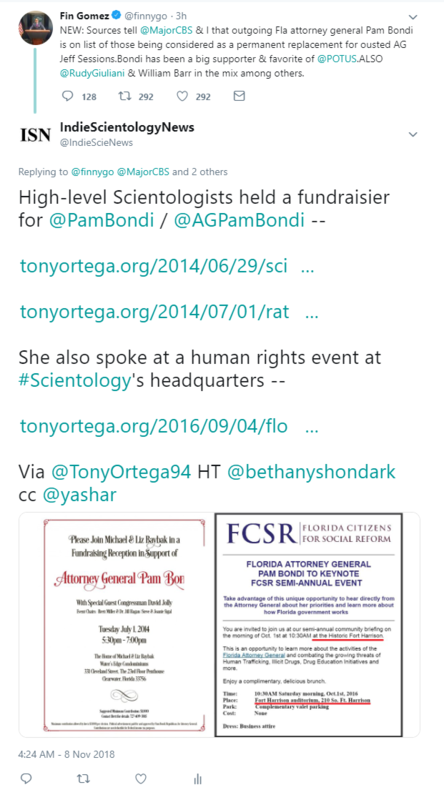 Tony Ortega has previously reported that Bondi appeared at a human rights event at Scientology's Fort Harrison Hotel, and that Scientologists held a campaign fundraiser for Bondi. 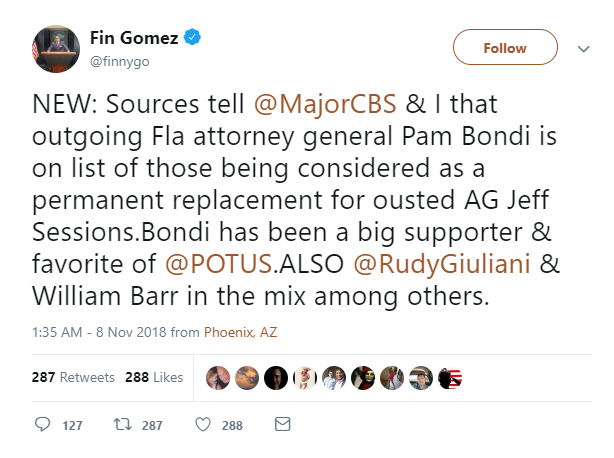 Fin Gomez is a a CBS News White House Producer covering President Trump. @MajorCBS is Major Garrett, Chief White House Correspondent for CBS News. Election Complaint Filed With DOJ Against Florida AG for 2013 Trump Foundation Contribution. Pam Bondi's fundraising group received a 2013 check from the Trump Foundation. A Democratic group affiliated with an anti-Trump super PAC filed a complaint with the Department of Justice on Wednesday night against Florida Attorney General Pam Bondi for the $25,000 her re-election fundraising group accepted from the Trump Foundation in 2013. "We believe that Pam Bondi, Florida Attorney General, and Donald Trump have violated federal voting laws including but not limited to bribery across state lines by way of a $25,000 campaign contribution from Trump to Bondi during her 2013 election by way of the Trump Foundation in return for AG Bondi dropping an investigation into Trump University. We ask the DOJ to investigate this matter," a complaint filed by the Democratic Coalition Against Trump reads.